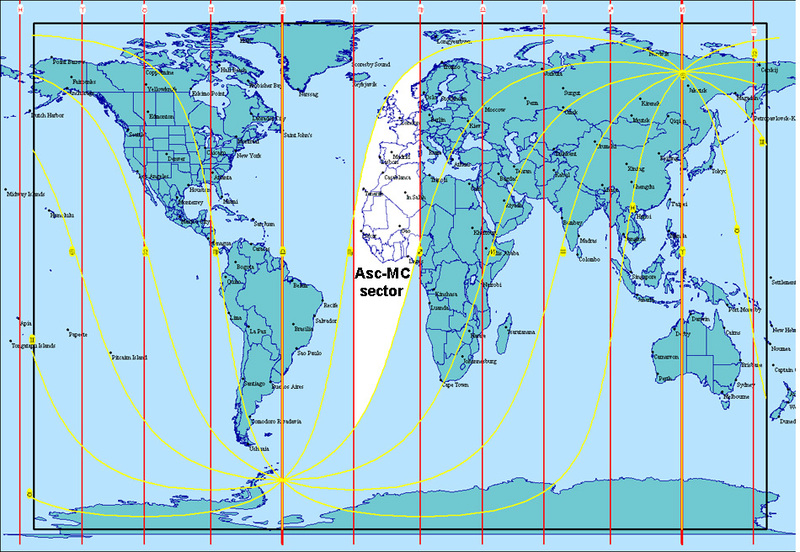 Below is a whole sign astrolocality map showing the natal Asc-MC sector of a particular individual. By combining the natal Ascendant and Midheaven factors together we substantially narrow down the world area which that individual represents or is most strongly connected to. There are now 144 separate sectors(12x12) rather than 12 or 24. Like latitude and longitude, the Ascendant and MC work together to give the native not only a more individualized or specific description of his or her persona but a more individualized or specific territorial affinity as well. The countries and peoples falling under the native's specific Asc-MC sector should be noted and studied as they are collectively tied into and form that individual's unique persona. How each sector relates to every other is a vast study in itself. More specifically, how one Ascendant relates to another or the MC is little discussed in astrology. There is some treatment of this in in the synastric works of Derek and Julia Parker where the Ascendant acts as the visible representative or manifestation of the MC's goals or wishes, otherwise little else.